Summers in San Diego are pretty awesome. They’re filled with gorgeous sunshine, lazy days lounging at the beach, deliciously fresh produce, and warm afternoons sipping on chilled white wine. Perfection. To pair with a lovely Chenin Blanc I had chilling in the fridge, I decided to make a tummy satisfying Grilled Shrimp Risotto. The wonderful light “crunch” texture from the shrimp balances so well with the creamy risotto. And although you may think otherwise, it’s surprisingly light making it a perfect summer time dish. In a large bowl, mix together 1 tablespoon olive oil, chili flakes, lemon zest, 1 tablespoon garlic, thyme and shrimp. Season with salt and pepper and allow to marinate in the refrigerator for at least 20 minutes. Heat a grill pan to medium high and cover lightly with cooking spray. Grill shrimp until they turn pick about 1-2 minutes on each side. Remove from pan and tent with a piece of foil. Meanwhile, heat the shrimp stock in a medium saucepan and keep warm over low heat. Heat the remaining olive oil in a large skillet over medium heat. Add onion and remaining garlic to the skillet. Cook until items are translucent, about 5 minutes. Add the rice and stir quickly until it is well-coated and opaque. Stir in wine and cook until the liquid is nearly all evaporated. Ladle in 1 cup of the broth into the rice. Simmer and slowly stir until the rice has absorbed the liquid. Add the remaining broth, 1 cup at a time. Continue to simmer and stir, allowing the rice to absorb each addition of broth before adding more. The risotto should be slightly firm and creamy–approximately 20 minutes in total. Gently fold the grilled shrimp into the risotto. Stir in Parmesan cheese and cook briefly until the cheese has melted. Check for seasonings and adjust with salt and pepper if needed. Spoon risotto into dishes and top with chopped parsley before serving. *The Shrimp Stock is a key component in layering the shrimp flavor throughout the entire dish. It can be made by simmering 2½ quarts of water with shrimp shells, 1 onion roughly chopped, 2 carrots roughly chopped, 2 cups celery roughly chopped, 1 teaspoon black peppercorns, 2 bay leaves, and a generous amount of sea salt. Simmer for 30 minutes, strain and use accordingly. Honey: I have to go and mop up my computer from all my drooling! Seriously fell in love the moment I set eyes upon this recipe! This has shot to the top of my list to try. I like that there isn’t too much spice. I have a real problem digestively with too much spice. Your comment make me giggle! 🙂 Thanks for the kind words and for stopping by! Was looking for something to make for dinner later this week – FOUND IT! Looks amazing! Thanks! Nice and creamy…looks delicious, Nam! This looks really simple and satisfying. Will try next week. Thanks for the recipe. You made my five to try list for the week. I really enjoy your blog! I make a risotto that is very similar to this. Tip: Add a little mascarpone cheese at the very end…makes it SUPER creamy. Oooh, mascarpone? Brilliant! Thanks for the tip! This is definitely going up on my to do list! Can’t wait. Is store bought shrimp stock OK to use with this recipe? I’m so glad you enjoyed it Nikki! 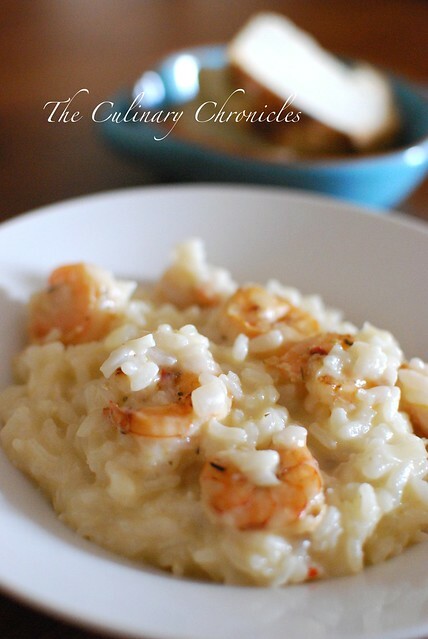 I love risotto but i have never had or made one with shrimps, this one looks nice and creamy.